Romantic fic with a quirky kick! Ahoy-hoy, friends! It’s the most wonderful time of the year! Not Christmas, but it might as well be! I am absolutely OBSESSED with the Olympics. Obsessed, I tell you! Are you as nuts about the sportsy-sports as I am? You’ve been parked in front of your TV set since last Friday, too, right? Okay, good. Once upon a time, I had visions of being in the Olympics. I planned on making my debut in 2004 in the sport of soccer, my most favourite sport in the whole wide world. But then I thought, hey, if I really want all the glory, or at least half the glory, maybe I should try for beach volleyball instead, my second favourite sport. A very close second, I might add. And so I kept flipping back and forth, eventually concentrating my efforts in soccer. I played at a very high level. When I turned fifteen, I was recruited to a rep team, which then led to tryouts for a provincial team. After only one tryout, I was added to the team. They called me the animal. I know what you’re thinking. This sweet face? Impossible! But it’s true, guys. I am fierce on the field. You do not want to come between me and the ball. It won’t end well for you. Christine Sinclair, captain of Team Canada, and my fave player evah! I was number 12, too! How I look when I’m playing beach volleyball. I think. I hope. So here’s a question for you: If you were competing in the Olympics, which sport(s) would be your specialty? December: it’s only a day away! Hi! I would play beach volleyball…without the volleyball. Or net. Okay so I would just go to the beach. Best I can offer. Haha! I’d help Tonga with a lot of things. 😀 You can cheer me on while I play beach volleyball, chillaxing in your beach chair. How’s that? I’ll be on the Olympic watching team. It really is cool to watch all the sports. I enjoy going to the channels that show the ‘less’ popular ones. I’ve watched shooting, fencing, and rowing along with the more ‘popular’ events like gymnastics and swimming. I think if I were to choose a team I’d want to be on the softball team. I used to love to play. I can totally see you as a softball player! How did I not know about the soccer thing and you? That’s insane! And illustrates why you’d only be my baby in another universe. I completely agree with Michelle, I’d be happy to participate in the beach-sitting event. Oh, wait, I know! I’d be on the team that makes sure award-winning women get the credit for their medals, not their husbands! How’s that? We definitely need one of those teams! The women competing deserve every ounce of credit for their victories. I bet some of them could give the men a run for their money! Of course you were an awesome sports star back in the day – and all of your dedication and hard work now benefit the students that you guide and encourage. Sign me up for the Olympic Watching Team. My only foray into organized sports was a disastrous year on my 6th grade softball team – the year we lost every game. 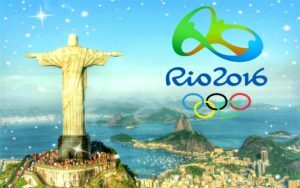 I too am a rabid Olympic fan – although my excitement had been dampened by all the horror stories coming out of Rio in the past few months, but once I heard the glorious notes of the Olympic theme, I was all in! Aww, Mary! You’re so sweet! LOL, I once coached a volleyball team who lost every match, but we won a single game in our last match of the season. We all cried and hugged and were jumping up and down with joy. The other team thought we’d lost our minds. Previous post Weekend Writing Warriors #2! Next post Weekend Writing Warriors #3! Julie Evelyn Joyce’s Super Fantastic Newsletter!